Adults £7 / Juniors £4 / Cub Free All of our shoots are strictly pre-book / pre-pay. Telephone bookings for ‘pay on the day’ will no longer be accepted. Shoot bookings close at last postal delivery on the Thursday prior to the shoot date….Please make sure your booking arrives in time. Adults £7 / Juniors £4 / Cubs Free All of our shoots are strictly pre-book / pre-pay. Telephone bookings for ‘pay on the day’ will no longer be accepted. Shoot bookings close at last postal delivery on the Thursday prior to the shoot date….Please make sure your booking arrives in time. A brilliant sunny spring day welcomed 80+ archers to our re-fashioned 38 shot 3D course. 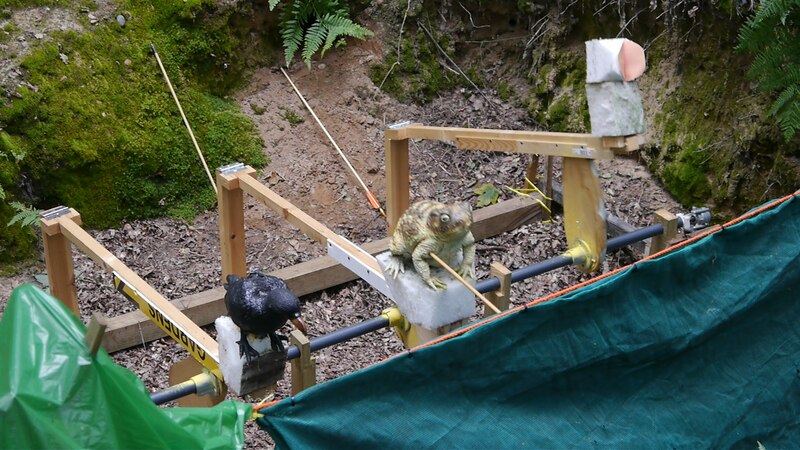 Bernie, Terry and team had turned the course round and created some significantly tricky shots for our new season including the optional Robo-Duck – the clang of metal piles on sheet steel could clearly be heard at the refreshment area! The turn-out made all the work worthwhile and the catering team led by Paul and Claire kept everyone fed and watered throughout the day. Big thanks to Steve and his Magic Monster who sped round the course afterwards to collect in the 3Ds. We look forward to seeing everyone again in July and / or November for our next shoots details of which can be found here on the website as well as via the NFAS. Our 2018 One Arrow Shoot turned out to be our most popular to date with almost 100 archers on site. 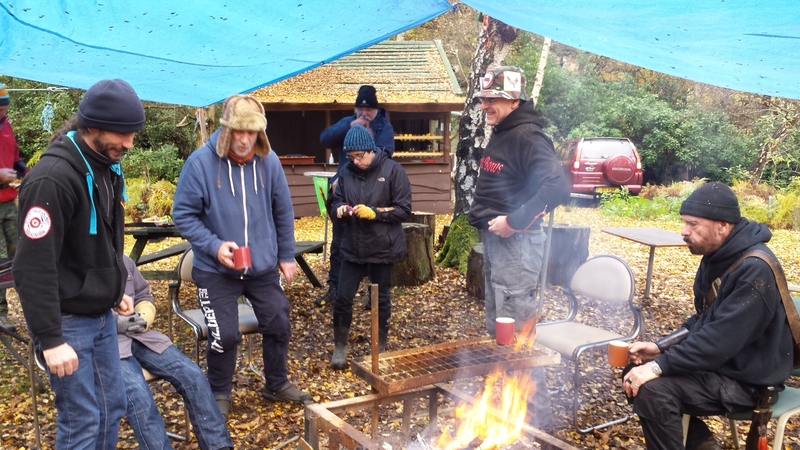 As dawn broke on a sunny morning our visitors were able to drive up the notorious hill to be greeted by a welcoming fire, a steaming urn and hot food courtesy of Claire, Paul, Anne and Barbara who kept every one going with bacon, burgers, cake and other goodies all day long. Due to the large contingent an e-mail message was sent out the day before asking people to arrive in good time so we were able to get everyone registered, out and shooting by just after 10:00 am. Thanks must go to Bernie and Terry assisted by club members for setting what is regarded by a challenging but enjoyable course and a big thanks to our visitors for bringing in most of the 3D’s at the end meaning that not only our visitors but also the site team were able to leave before dark. On yet another blisteringly hot day of this summer to be remembered, over 80 hardy folk turned up for our second open shoot of the year. Having initially panicked about where we were going to park everyone, we eventually got the use of the paddock at the top of the course which eased the potential congestion and made life much easier for Simon, our parking marshal. Bernie, Terry assisted by Chris and Pedro had subtly tweaked the spring course with the addition of some new 3D’s all of which provided the usual cries of “You have to be joking!” but did provide a crop of significantly high scores including our first 700. So thanks once again to the course team who worked long days in the heat to get the course ready and also to Steve for the use of his awesome quad bike and trailer for shifting the 3D’s back to the shed at the end – very much appreciated. Also, a huge thank you to the catering team of Claire, Paul, Anne and Barbara who managed to keep everyone fed and watered on such a challenging day. It can’t have been much fun being in a hot kitchen all day so your efforts are doubly appreciated. The club goes from strength to strength with membership rising and shoot attendances on the up, so if you live within driving distance and want a great all year course to shoot over, please consider joining us. Details are on the web site. Our shoots for 2018 can be also found on our website and also the NFAS shoot list. After the ‘Beast from the East’ it was a relief to gather on a mild spring day – slightly overcast to begin with but bright and warm by the end. Bernie and Terry had set another deceptive course incorporating random Easter Eggs and Bunnies as well as the more traditional 3D’s. The layout in two loops gave everyone the chance to pause for the excellent refreshments provided by Claire, Barbara and Paul. Thank you for all you hard work and preparation. General opinion of the 60 + attendance, was that this was yet another classic Magna Carta course with only a couple of details for our new course setters to sort out for the next shoot (Many thanks to those who pointed out the odd issues on the day). A big thank you must go to the course team of club members who worked long days in the off season and also on the day to get the course ready, organise parking and then help clear up afterwards….you know who you are, so thank you! The club goes from strength to strength so if you live within driving distance and want a great all year course to shoot over, please consider joining us. Details are on the web site. 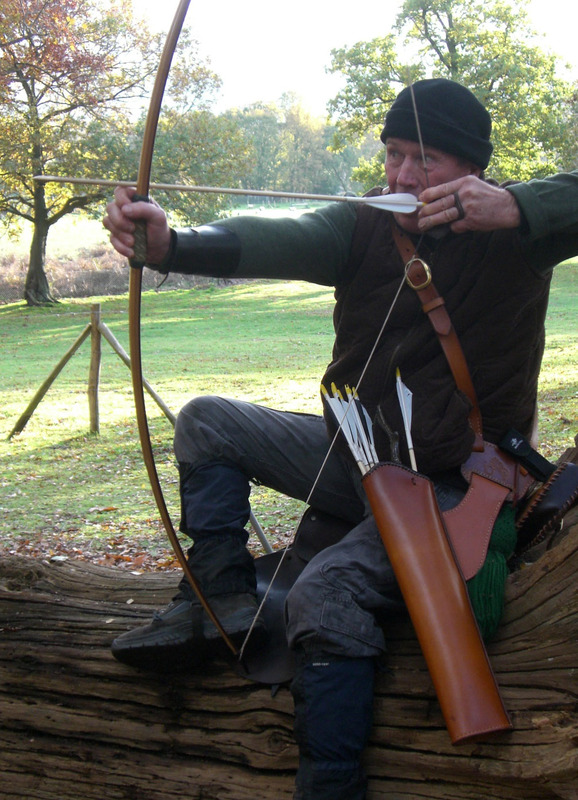 Our annual Autumn One Arrow Challenge has proved to be firm favourite in the NFAS shoot calendar. 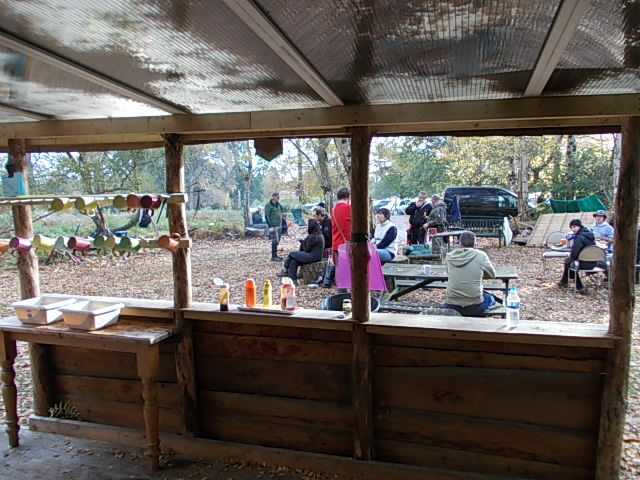 On a frost morning 70+ archers turned out and tackled the drive up the hill to the car park to be rewarded by a welcoming fire, hot food and drinks courtesy of Claire, Paul, Anne and Barbara. Once shooting got underway on the course of 38 x 3D’s, cunningly placed by Bernie and Terry, the sun came out and it was smiles all round. The course sported some brand new 3D’s (purchased to replace those stolen earlier in the year) and the challenging terrain, low sun and tricky positions all provided the challenge our visitors have come to expect at Magna Carta. The usual raffle was held and a get well card signed by many archers for Wally who was taken very ill at a Co:60 shoot the previous day. We all wish him a speedy recovery. Once again thanks go to the course team and their helpers and also to the refreshment team for the endless supply of bacon, burgers and cake. Our shoots for 2018 can be found on our website and also the NFAS shoot list. Sunday 9th April turned out to be the warmest day of the year so far and, having been blessed with fine weather we were also blessed with a great turnout of 60+ archers all champing at the bit to get to grips with our new course. Bernie and Terry had set 38 deceptive targets in two loops which gave everyone the chance to pause for the excellent refreshments provided by Claire, Anne and Paul. Thank you for all you hard work and preparation. 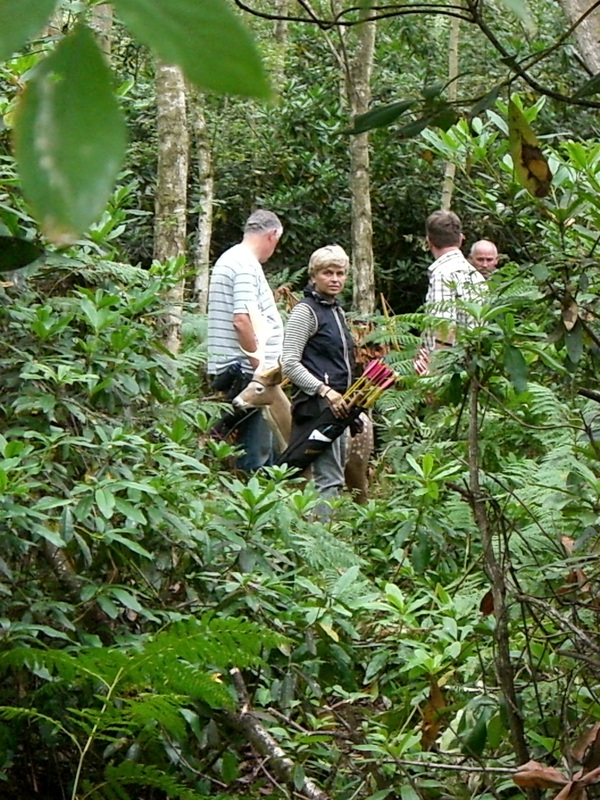 Our course is split into two halves – the flattish Rhododendron infested part and the infamous hill which this year has even more ups and downs – more suited, it would seem, to mountain goats than archers. Nevertheless, the general opinion was that this was yet another classic Magna Carta course with only a couple of details for our new course setters to sort out for the next shoot (Many thanks to those who pointed out the odd issues on the day). Shoot dates for Magna Carta Field Archers - 2017 N.B. All of our Open Shoots are pre-book / pre-pay. Bookings close on last post - Thursday prior to the shoot date. 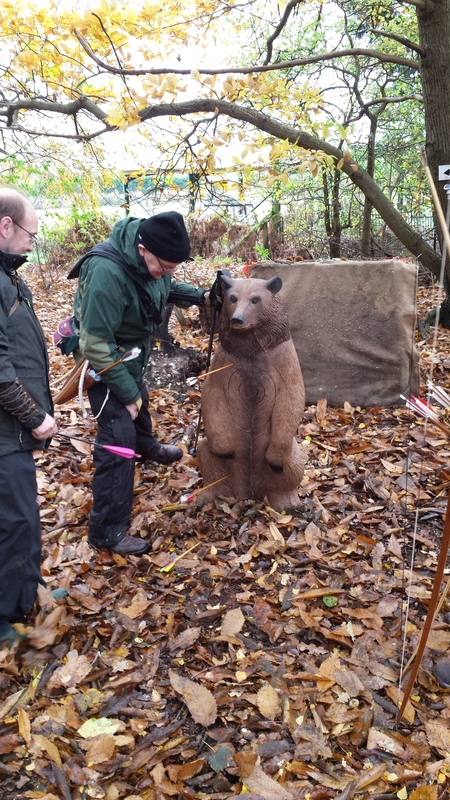 Our annual Autumn One Arrow Challenge turned out to be even more of a challenge this year – the challenge being just getting there in the first place. Storm Angus did his best to deter or wash away our visitors but, Hey! - Rough Tough Field Archers are not so easily deterred. In the end 44 from a booking of 61 braved the entrance to the car park and then shot round our course of 38 x 3D’s, all cunningly placed by our devious course setters. 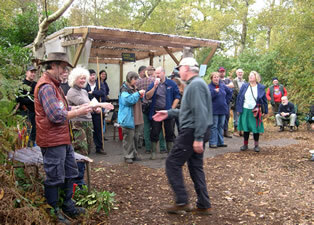 A welcoming fire on arrival and the hot refreshments provided all day by Claire, Paul and Anne kept everyone going. A big thank you to the refreshment team and the course team (Bernie, Terry, Martin, Wally etc) for making everyone welcome and well fed. Our shoots in 2017 can be found on our website and also the NFAS shoot list. Our summer shoot proved to be another fine and sunny day shooting amongst Magna Carta’s dark rhododendron strewn woodlands. The contrast of light and dark, flat and steep continue to provide opportunities for sneaky “where the **** is it!” and tight window “You have got to be joking!” type shots that Magna is now well known for. On the day 50 archers booked and shot the course set out by Wally, Bernie, Paul & Clive and comprised 41 X 3D targets over 38 pegs. 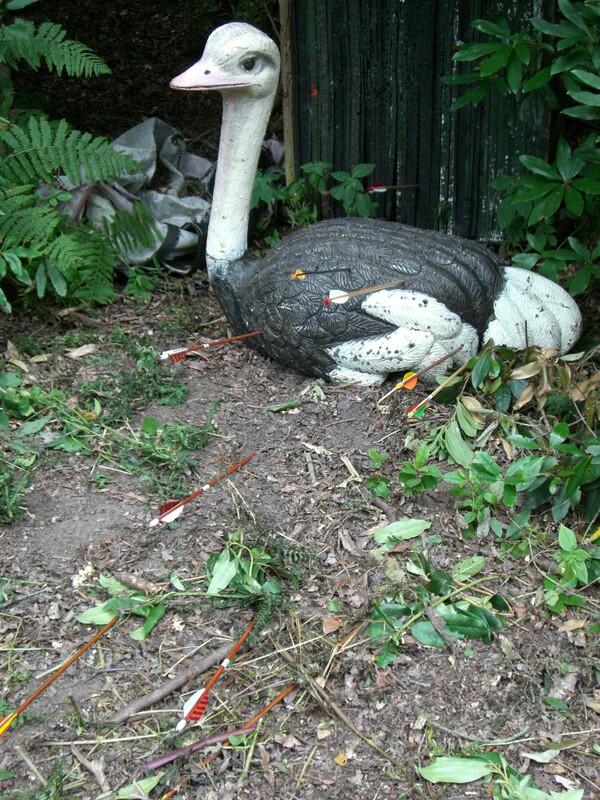 Wally excelled himself with his inventive new moving 3D target which, judging from the shouts and curses, was enjoyed by many. Those MCFA club members that volunteered their time to help set up the course and marshal throughout the day. The refreshment team of Paul, Clare and Anne who provided hearty high quality food and drink throughout the day. Wow! Following a day of water-running-down-the-neck weather the shoot day turned out to be fine, dry and at times sunny, but that’s what you tend to get when you shoot at Magna Carta. This was one of our best attended shoots for some time so a sincere vote of thanks to all those who believed the weather forecast and turned up to shoot at a range of 3D’s from the diminutive ‘Mrs Tiggy Winkle’ (about the size of a can of beans) to Ollie Ostrich (back on his legs for the first time in living memory). 39 sneakily placed animals and one arrow at each meant that the day progressed smoothly and we were all done and dusted by about 2:30 which meant that people were able to get away in daylight. Votes of thanks go to the course setters (the ones who braved the weather), the refreshment team of Claire, Anne and Paul for keeping everyone fed and watered from 08:00 onwards and our land owner for allowing us to hold these events. We look forward to seeing you all again at our 2016 series of shoots. At the preparation stage in early July this looked set to be our best shoot of the year with nearly 80 archers booked in, a great course set by Wally and the rest of the team, refreshments all ready and 41 sneaky targets all waiting to missed (but only just of course!). On Friday we had a months’ worth of rain in 24 hrs and although it cleared on Saturday it came back with a vengeance on the day of the shoot - like stair rods at times! 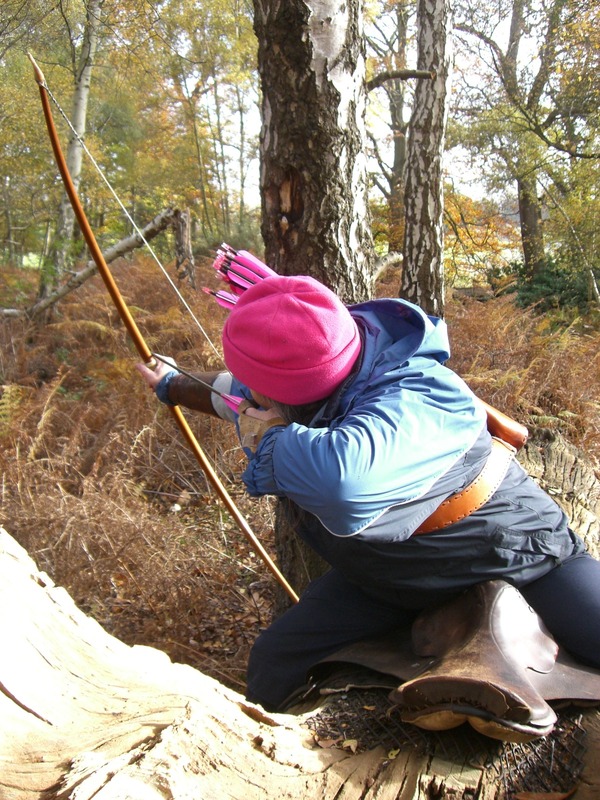 Although we had some cancellations and no-show’s we still had nearly 60 archers plus our own club members who braved the conditions in our dense and often steep and slippery woodland. 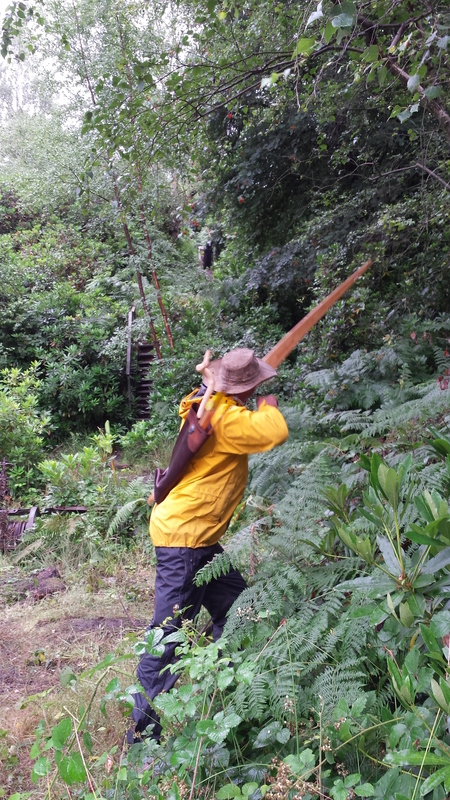 A few retired, partially drowned, but the rest soldiered on and in fact after lunch the rain cleared and although it remained grey and chilly it was at least dry – unless of course you were hunting lost arrows in the rhododendrons! 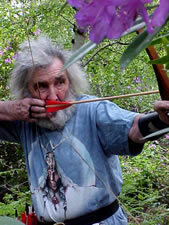 3D’s ranged from the tall standing bear up an impossibly steep hillside, several fan shots, a predator and prey shot, down to the tiny ‘Mrs Tiggiwinkle’ hedgehog at only a few yards away. Robo Duck stayed away on this occasion as he didn’t want to get rusty! 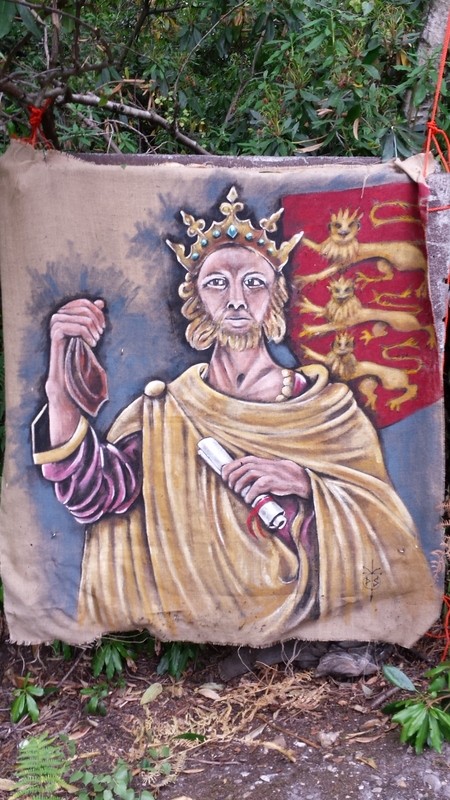 As this was Magna Carta 800 celebration year, Wally had obtained two special painted hessian faces, one of King John waving his money and clutching the Great Charter and the other, one of the Barons, obviously looking for King John. 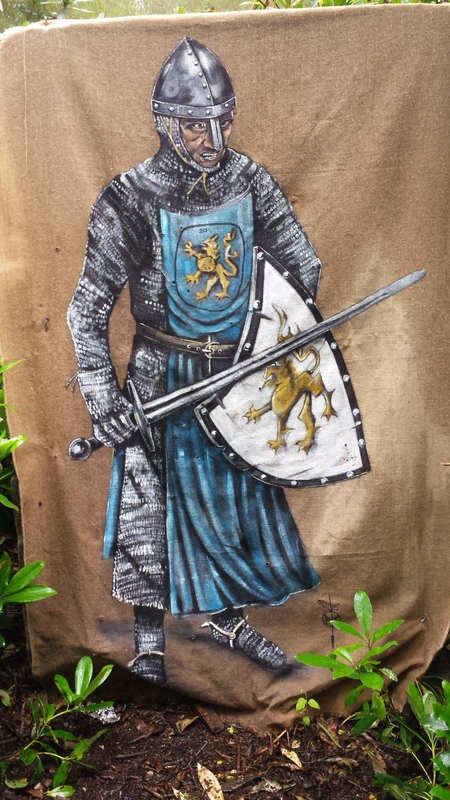 Wally had entered into the spirit of the day by tuning up as King John in a ‘costume’ which included a very fetching pair of black tights which, from the back, revealed more of Wally than he perhaps intended. Votes of thanks go to the course setters already mentioned, the refreshment team of Claire, Anne and Paul and our land owner for allowing us to hold these events. Of course the biggest ‘thank you’ – considering the conditions on the day – must go to the gallant band of visitors, some of whom had travelled a considerable distance to shoot our course. We look forward to seeing you all again at our next shoot. 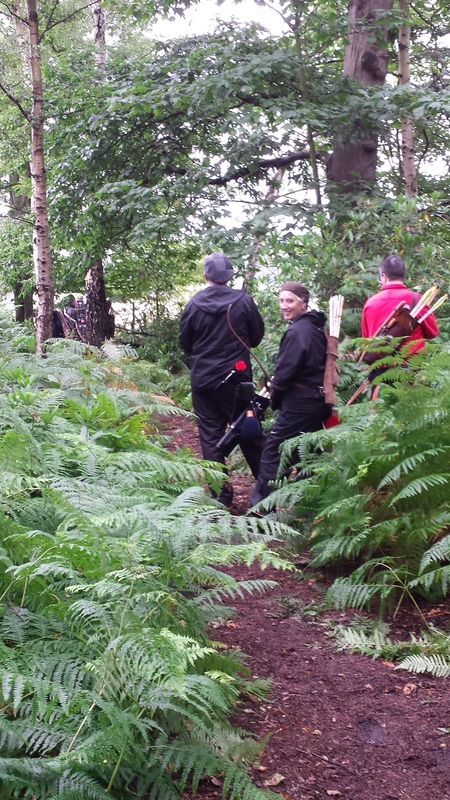 A fine days shooting amongst Magna Carta’s dark rhododendron strewn woodlands. On the day over 50 archers booked and shot the course which was a well set out and challenging 43 X 3D and Hessian targets over 36 pegs. 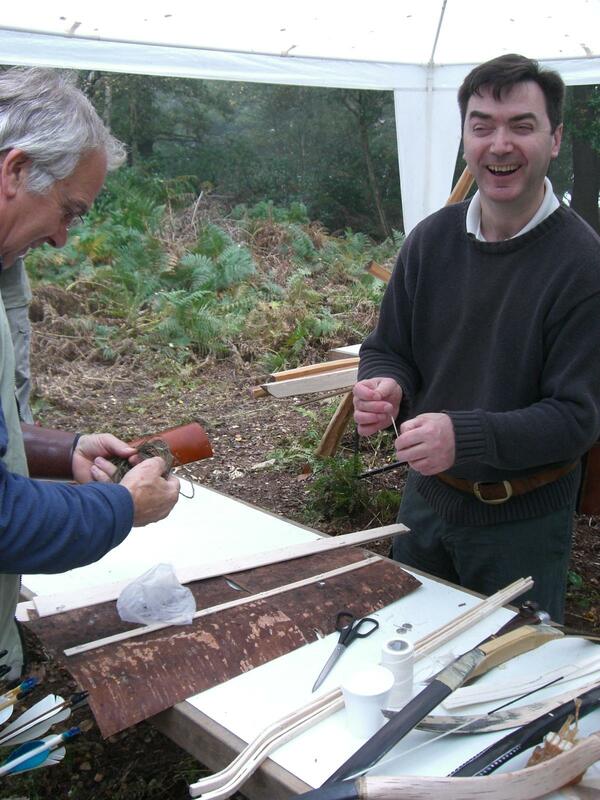 Another sunny day in the woods at MCFA spring shoot….seems we have a direct line to the weather person up there! We had a great turn out this year for our season opener with 70 plus archers turning up to shoot 36 ‘interesting and / or challenging targets, mostly 3D with a few hessians thrown in for good measure all set out to decieve by our course meistro, Wally, assisited by Keith, Mark, Paul, Clive and other club members. 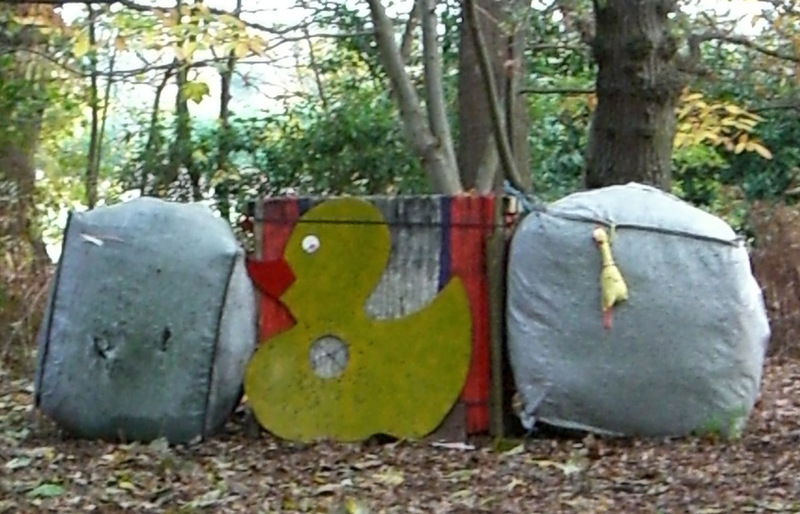 Robo Duck was out on the practice butts and the clang of arrows missing the centre resounded round the area as archers tried to get their eye in. 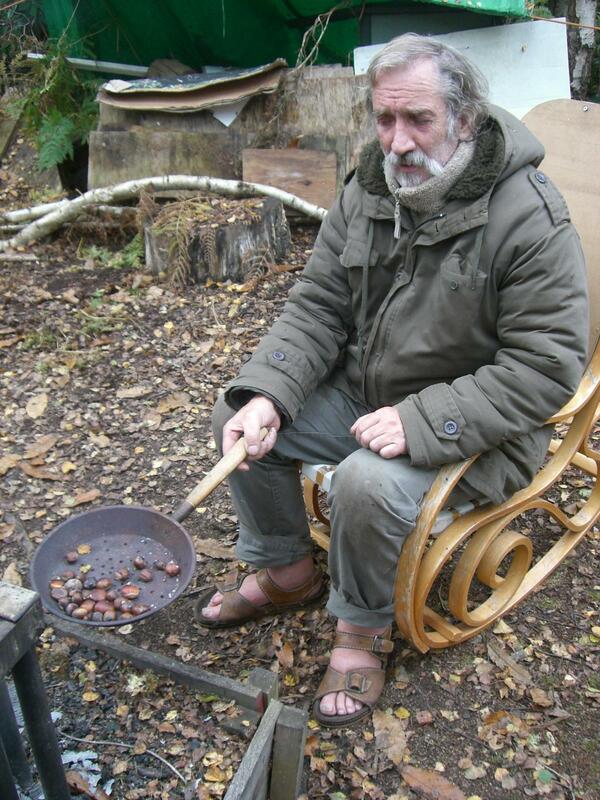 Food and drinks were available all day courtesy of Paul, Claire and Anne – so no one went hungry. Our experimental ‘American Style’ one arrow shoot proved a great success. Initally people had questioned if it was going to be long enough (value for money?) but were reassured that there would be plenty of additional targets to shoot at to compensate for the one arrow at each target rule. Wally, who masterminded the shoot, had also carefully sited the shots to take advantage of sneaky angles and obstruction so that, although the distances were considerably reduced to ‘ethical hunting distance’, each shot required some thinking about. In the end 70 archers booked in to shoot some 45 targets set out over 36 pegged postions including some ‘Fan’ and ‘Predator & Prey’ which, with the added bonus of scoring 24 on most, gave people plenty of opportunity to watch their tally rise to a potential 1060. We started the day early with assembly at 9:30 and in fact had groups out and shooting by 9:45. This meant that our aim of getting people round and clear of the woods in daylight was achieved. Anyone who shot in our woods will know that once the light goes under the Rhododendrons it’s almost impossible to see a target let alone hit it! Refreshments were provided all day from about 8:00 but the redoubtable team of Claire, Anne and Paul so no one went away hungry. Comments on the day were positive and we will seriously consider using this format again for our end of year shoot next year. It hardly seems a year since we lost the use of about 1/3 of the woodland we had enjoyed for so long. However the general consensus of those who attended out latest shoot was ‘less is more’ and that Wally can be just a sneaky and devious in his course setting regardless of how much space he has to play with. 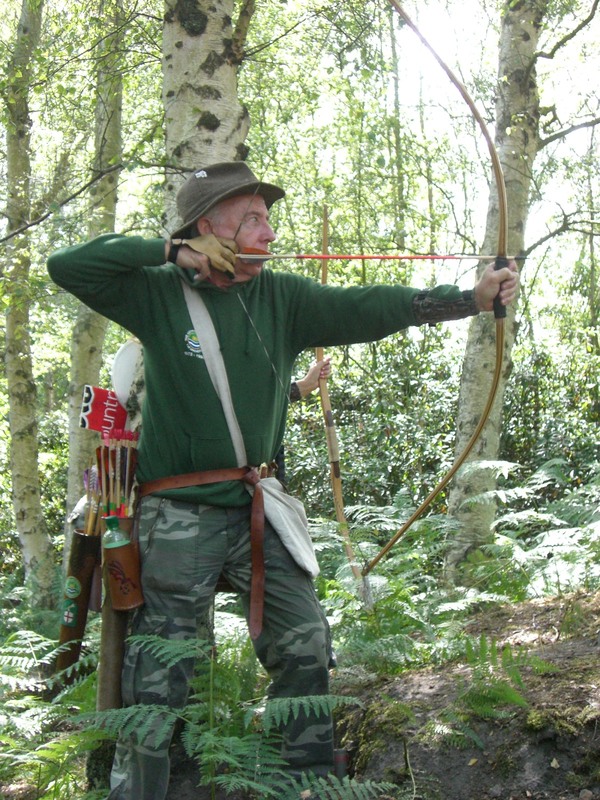 About 100 archers turned out for our end of season event including many regulars and a fair few new to our distinctive woodland with it’s dips and folds, open spaces and dense and unforgiving Rhododendrons. Wally had set a challenging but ‘hittable’ course of 36 mixed 3D’s and hessian faced targets. The weather stayed on our side all day (the sun even came out at one point) and the food factory run by Paul, Clare and Anne provided a constant stream of hot and cold food and drinks throughout the day. In fact Anne’s cakes proved such a hit that they not only sold out but Anne received at least three proposals of marriage there and then! Shoot like this don’t just happen and a large thank you must go to the rest of the MCFA members who turn out for work parties and on the day to support the event and make sure our visitors go home happy. Finally I would like to extend a very big thank you to all those visiting archers who have attended our shoots throughout the year – often travelling a considerable distance to do so. Without your support and comments we would not be able to put on the shoots that you enjoy. Have a good Christmas and New Year. We look forward to seeing you and your friends in 2012. Our November shoot very nearly didn’t happen this year. About three weeks before the shoot date, part of the woodland we shoot over was sold and the new owner announced that he wanted all the targets out immediately. When he was asked for a few weeks grace as we had a major competition coming up he calmly told us to cancel it! Enter our Fairy Godmother in the form of Wally who spent the next two weeks virtually single handed hauling 60% of the course out of the now off limits land and redesigning the course with new placements, access ways and course marking. Thanks also to the team of six members who did the final prep’ the day before the shoot to ensure that we had 36 targets ready to face the 100 plus archers who turned up the following day. Parking was also going to be an issue but Chris our landowner was happy to allow us to use one of the top paddocks – except it rained quite a bit in the days leading up to the shoot and the hill was getting a bit slippery. Nevertheless, on the day most of the archers managed the hill climb and probably enjoyed the additional, unexpected challenge of rally-cross style driving. Wally had laid a mixed course of 36 assorted, 3D, 2D hessian and paper faces, all cunningly set to challenge and confuse ranging from a large browsing Zebra to a very skinny Meerkat. There were a few anxious moments regarding the ‘saddle shot’ with several variations of seating position by those who fancied a bit of horse archery. Robo Duck also made a re-appearance – close enough to the club hut to raise a cheer or two at the distinctive sound of pile on steel although there was an optional ‘Chicken Shot’ for the…..chickens. We would like to extend a big thank you to all our visitors who kindly brought in the 3D’s at the end of the shoot – it certainly made our job a lot easier. Catering was of the usual high standard with food provided throughout the day by Claire, Paul and Anne. Finally, thanks to Chris Butcher for allowing us to continue using his land. A happy band of archers arrived for MCFA‟s summer shoot to find a brand new car park cunning concealed right next to the registration area – at the top of the hill! However, this new facility is only temporary as it forms the base of a new Menage or horse training area. Contrary to rumour, MCFA has settled into a very good working agreement with the riders who stable and ride their horses on the site and the prospects for a long and mutually beneficial relationship seem good. Membership is up and the course gets better each year. The course comprised a range 38 of realistically placed 3D‟s, superb painted hessian faces and a few big game paper faces all cunningly concealed in the undergrowth with just enough dead ground or foliage to confuse and distract. 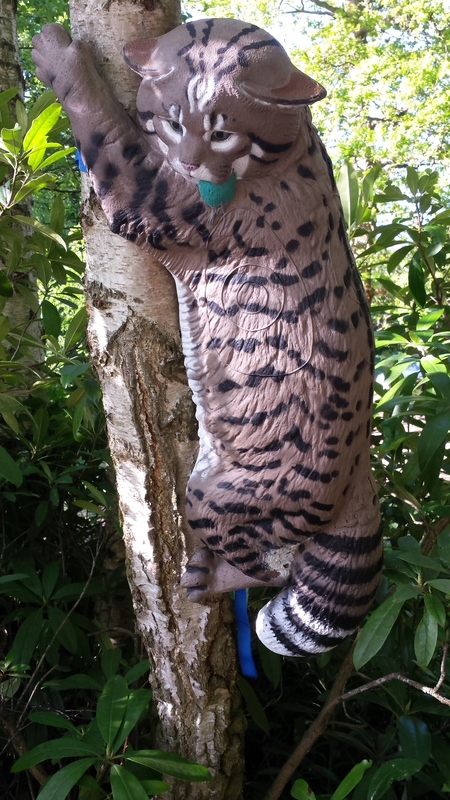 Despite this, and the ever present Rhododendrons with their arrow attracting tendencies, every one seemed to have had a really good day and the range of excuses was inventive to say the least. Catering was provided by the usual team of Paul, Claire & Anne and the new range of china tea & coffee mugs instead of plastic beakers went down really well – as did all of the food. Thanks also to Chris and Mark for helping with the work on the day and also to Chris Butcher for allowing us to continue using his land. 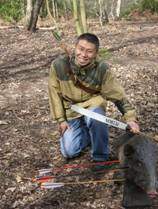 A great start to 2010 for Magna Carta Field Archers. 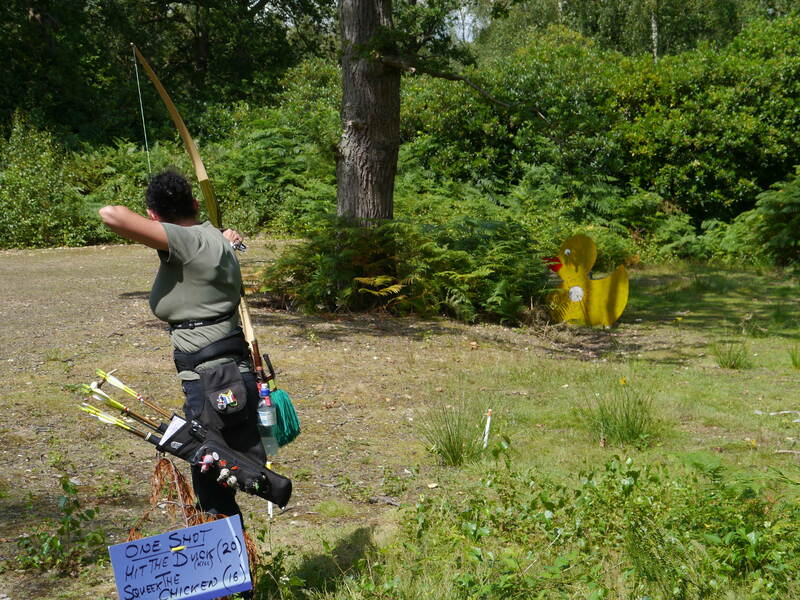 A sunny day, 80 + archers, a ‘challenging’ course and excellent catering all contributed to a memorable day in Magna’s famed rhododendron infested woods. 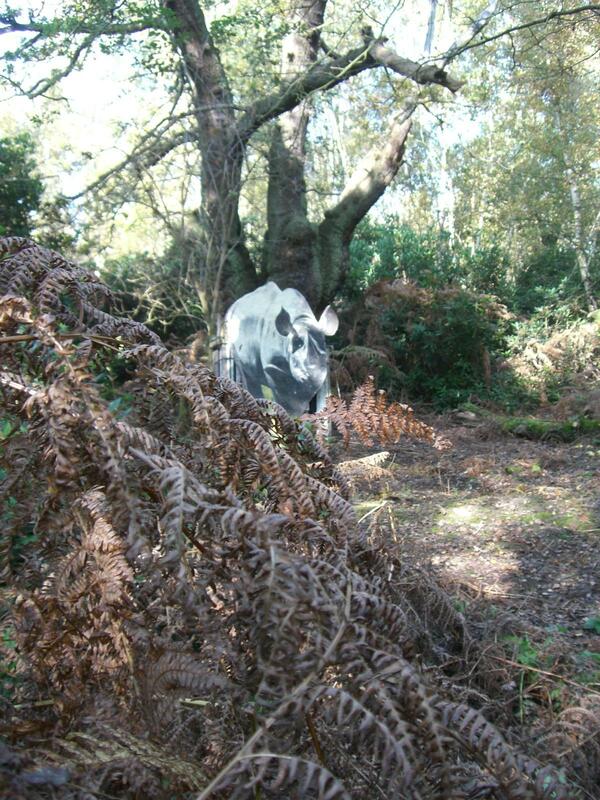 The course comprised a range 38 of realistically placed 3D’s, superb painted hessian faces and a few big game paper faces all cunningly concealed in the undergrowth. A big thanks to Wally and the rest of the course team for setting such a sneaky but shootable course including the option of the ‘chicken’ shot as an alternative to Robo Duck. Finally, thanks to Chris Butcher for allowing us to continue using his land and for introducing us to his neighbours all of whom were very impressed with the way in which field archers conduct themselves (can’t think why!). It was with some relief that, following last years Foot and Mouth fiasco, we were able to confirm that our spring open shoot was able to go ahead. Archers who had booked for the October shoot had been contacted and were automatically transferred to this one and, along with all the rest who it seems had been waiting patiently for our ground to re-open, made an impressive entry of 106 pre-booked archers on the day. It is a tribute, I hope, to our growing reputation for ‘interesting’ (some call them ‘challenging’) courses, friendly faces and good food that people had travelled some considerable distances to get here including all round the South East coast, Oxford, down into Dorset and even as far as Mongolia – although it should be pointed out that Yi was already in the area so I suppose that doesn’t count! The course setters headed by Roger had planned yet another devious and sneaky course of 40 – mostly 3D or cut-outs, all in cunningly placed situations which although not at any great distance, proved able to fool most of the people for most of the time. 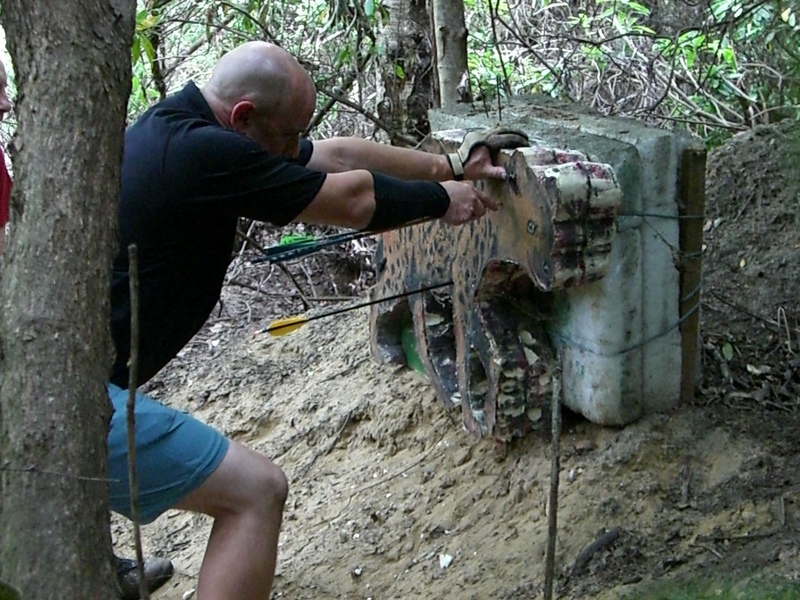 This, coupled with shooting to wound lines, kept the top scores in the mid 500/600’s – no mean achievement considering the layout and topography of our ground and cries of “How did I miss that!” seemed to be the most common comment of the day. ‘Robo Duck’ made his usual appearance – albeit in a supporting, not Robo Duckscoring, role and the clang of spent arrows (including a flint tip!) resounded at intervals throughout the day. 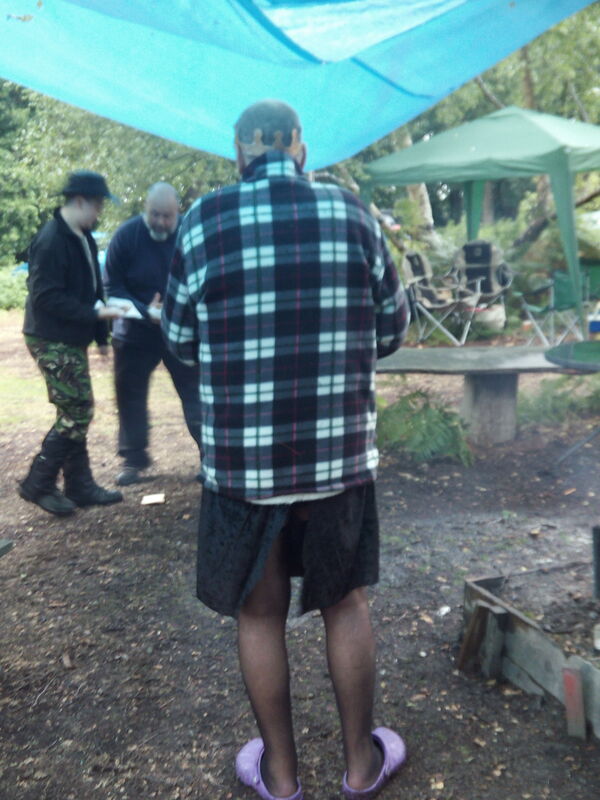 However, this did not detract from peoples’ enjoyment and the weather, which had been really wet the day before, was kind with clear skies and sun developing as the day wore on. All in all our first shoot of the year was a great success and bodes well for the remaining five as many archers have already booked ahead for some if not all the others. 80 archers travelled through the fog to attend our first Annual Charity Shoot in aid of the Edward Bright Fund. We had a sometimes challenging course laid by Roger and Wally, helped by club members and even seconded family members where extra muscle were needed. Catering, as always, was excellent with archers generously throwing their change, and more into the charity collection pot conveniently positioned in the middle of the catering window! 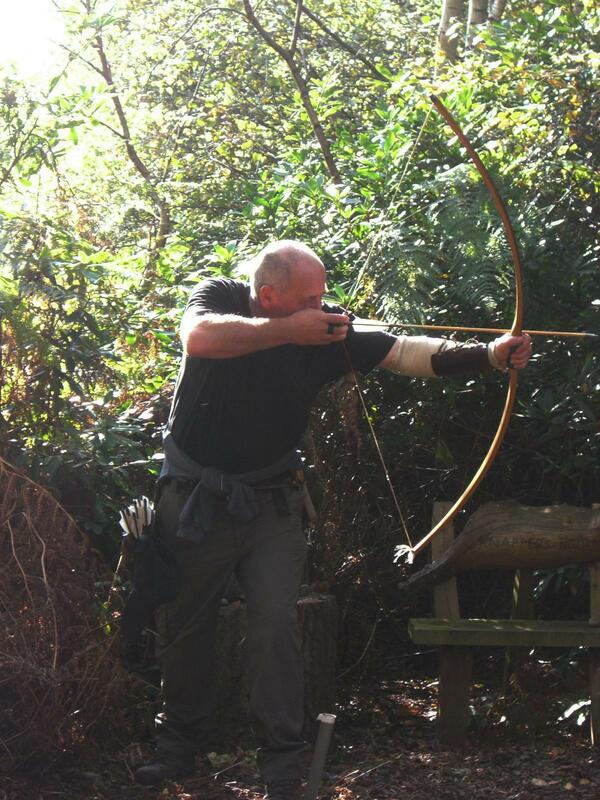 We were privileged to have Chris Boyton and Andrew Hall sharing their individual skills and knowledge throughout the day with demonstrations of bow making and fletching and At one target, with the shot over a recently dried up pond, 3 archers took a short cut and nearly disappeared in the swamp. Their good natured reaction, and relief on getting back to the tea tent in one piece, was an example of the mood of the day and prize giving took place with lots of smiling faces and a pleasant sunny afternoon. With the land owner generously allowing the shoot to take place without the usual charge an amazing £600 was raised for Edward. Well done everyone and we hope to see you all again at our Christmas Friendly on Saturday December 13th. 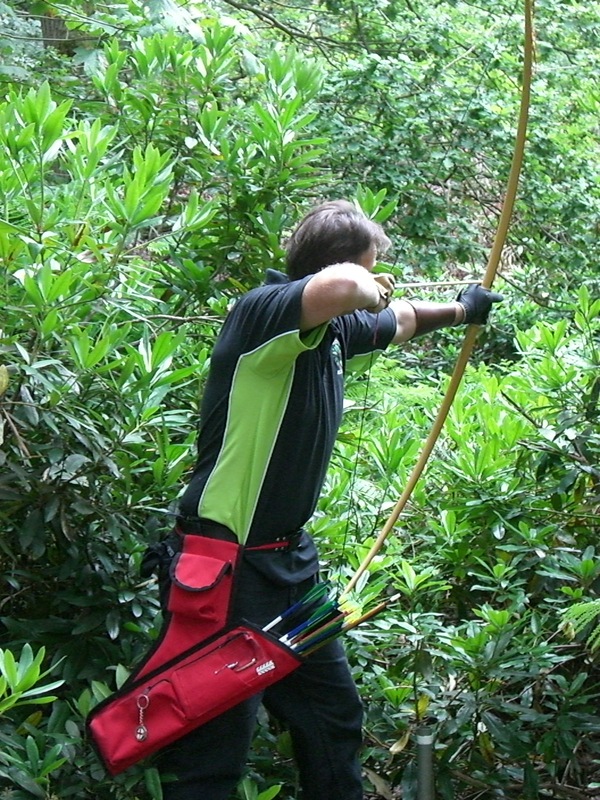 This club was formed with the express purpose of promoting the sport of Field Archery and for developing a love of, and an appreciation of the Flora and Fauna of our native woodlands. The club is run by agreement of the landowner and under the auspices of the National Field Archery Society (NFAS), membership of which is a prerequisite before shooting takes place. Family membership is welcomed but young people under the age of 18 years must be accompanied by an adult member AT ALL TIMES on the site. Access to our field course at Lyne at times determined by the club and the landowner as set out below, [excepting Christmas Day, Easter Sunday & Shoots]. N.B. Shooting areas will be restricted at certain times to allow us to work co-operatively with the new riding stables and rides which cut through part of the woods. Please be aware that these are new shooting times. These times may be subject to change in which case you will be notified. A concessionary rate of £3 (2018/19) at Open and Friendly shoots held on our course. Club members must be paid up members of the NFAS. Club members must produce, on demand, current club membership and NFAS cards. Club members’ cars must display a current windscreen card whilst shooting is in progress. Club members are expected to assist on work parties, which are needed from time to time in order to set out courses, make targets and maintain club equipment. To join the Magna Carta Field Archers please print the application form and return it, completed to the address shown on the form. The club was started in 1994 by the Magna Carta School with the aim of demonstrating to school students that there are alternatives to the more conventional youth sports and to provide an opportunity for individual development, which was not based in team activities. It soon became obvious that the sport attracted a wide range of different student types and ages all of whom enjoyed the benefits that Field Archery has to offer. Whilst our membership was to say the least transitory, [starting at age 11 - ending at age 16], a number of older members have returned following a period away at college and now provide real help in coaching the new members. 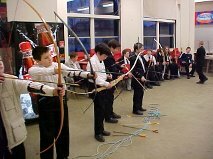 When the club started it did so with an initial grant from the school PTA which bought 12 glass-fibre Flat Bows, 12 bracers, 12 tabs and a few dozen arrows. Since then the club has been self financing, thanks in part to the work of the youngsters in making and mending tackle. The club now has a selection of Flat Bows and Recurves for the youngsters to try out and once they have shown a more than passing interest they are encouraged to buy their own bow and make their own arrows. Other kit is generally adapted or made in order to leave cash to go towards targets for our club ground, (generously provided by Chris Butcher), near Chertsey in Surrey where we have now gained something of a reputation for the open competitions which we have staged over the last few years. During the time the club has been shooting in open competitions we have enjoyed a number of successes with medals being won on most occasions. There really is nothing like taking a nervous novice to their first shoot and see the look on their face when they show mum / dad their medal. I this respect I would like to say a most sincere thank you to the members of those clubs who have made our youngsters welcome and in particular 'Co: 60' who have always supported and encouraged these young archers. 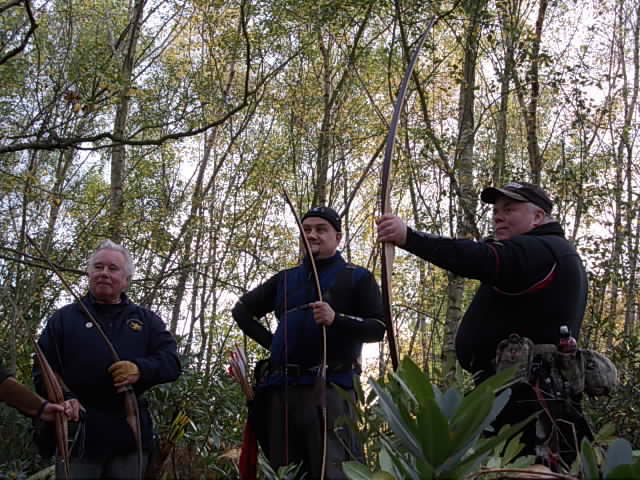 In 2003 the club opened it's doors to full membership which has allowed local archers to make use of the varied terrain on the 38 target site. 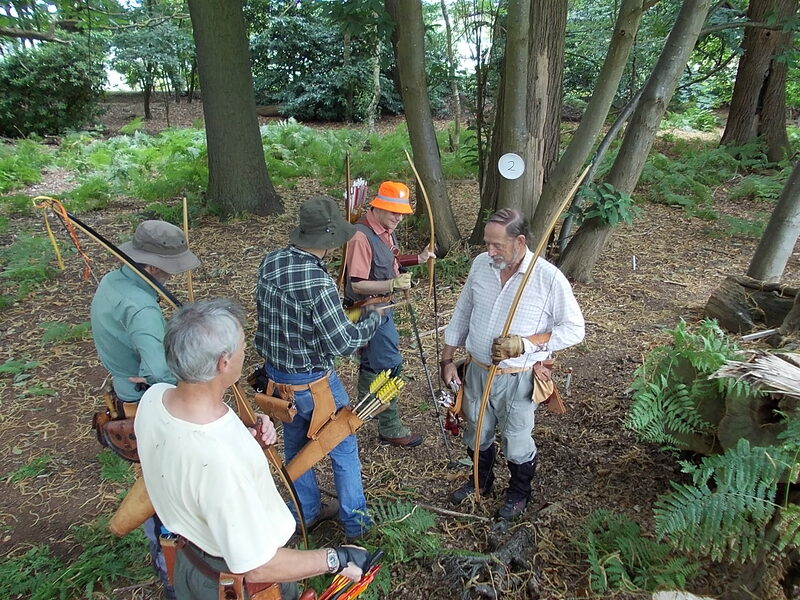 The increase in adult membership with the availability of work parties has also enabled us to put on more open and friendly shoots during the year and also to develop our densely wooded, and in places steep, site into what is now becoming recognised as a very testing course. In 2007 the club moved into its next phase. The Magna Carta School Field Archery Club (TMCSFAC) continues to run its school based training and shooting sessions whilst the adult section has been re-named Magna Carta Field Archers (MCFA) with the modified logo above and full club constitution under the auspices of the NFAS. Most people visiting the club ground for shoots will not notice much difference but significantly for the school, there are now many more qualified archers to assist with the day to day running of the club, shoot organisation and, at times, student coaching. In view of the clubs new status and because of the current child protection legislation pictures of children on this site will not be accompanied by their name. Students of The Magna Carta School who wish to compete are encouraged to do so but must be accompanied by the school staff, a parent who agrees to walk the course with them or a cleared member of MCFA. If you would like to join us please, see the details on the Membership section.